Quick Home Websites Review - SCAM? See the LIES! 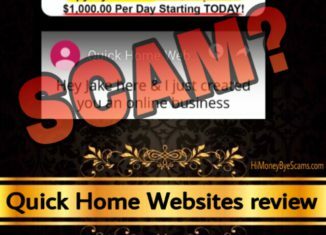 Home > Online opportunities > Quick Home Websites Review – SCAM? See the LIES! Welcome to my Quick Home Websites review! Are you wondering if you can make $1000 today with this system? Or is quickhomewebsites.com a scam that will not work? If you have these kind of questions, I’m glad that you’ve landed on this post because here I’m going to reveal the complete truth about this program. Also, let me congratulate you for taking the time to do your own research before purchasing another money-making product. As you know, there are too many frauds out there, so doing your due diligence is the way to avoid the scams and discover the genuine way to earn passive income from home. When it comes to Quick Home Websites, it’s not as wonderful as they have told you, so keep reading to find out how it really works. 2 What is Quick Home Websites about? 3.1 Does it only cost $37? 4 Is Quick Home Websites a scam? What is Quick Home Websites about? The moment I landed on the Quick Home Websites sales page, I thought I was in front of another scam program because the sales page looked so similar to other sales pages I have come across. However, I like to see the best in the programs I review so I didn’t want to think this was another scam. That’s why I took the time to do my homework before coming to a final verdict. According to the spokesman, “Jake”, he has created a money-making account for you that is making you money while you watch that video. To be honest, I couldn’t help but laugh when I heard this because it makes no sense. If making money online is so easy for him, why does he want to make you money if you haven’t done anything for him? Not only that, is he making money to everyone who’s watching that video? LOL. It’s not even a live video… it’s a YouTube video that has over 600 views. The truth is that he claims you’re making money to get you excited and make you think that this is the real deal. Generating an income online definitely takes way more than what he claims. Everything he says and shows just gives people false expectations, so what he’s doing is not ok because he’s trying to make money unethically. It’s posible to earn $1000 per day, but it doesn’t work like he says. It takes a lot of effort and work to get there, you will never hear an ethical business owner say that building a successful business happens overnight. You see, if it was that easy, don’t you agree that many people would have already quitted 9 to 5 jobs they hate? Anyone who promises you will can make money without doing much work is clearly trying to rob you blind. Therefore, I don’t believe in what the spokesman says, there’s no truth in his words. The sales video is pure hype. Quick Home Websites works in a way that the owners & their affiliates are the only ones who make money from it. It wasn’t created to help you make money. You probably came across quickhomewebsites.com via an email that someone sent you. The person who sent you the link to this “system” is more than likely an affiliate, who gets to earn a commission if you buy this product through his link. Then you visited the quickhomewebsites.com website and started watching the sales video, which was created with the purpose of getting you excited to take your money. There’s a lot of information they don’t tell you, since you would probably not buy this product if you knew that it’s not as awesome as they advertise. You can’t definitely not make money by copying a website. It doesn’t work like that and I’m about to tell you why. First of all, you need a product or offer to sell and visitors who visit your website. Without these two components, you cannot make any money. This is something that they don’t mention, which is a big red flag because it indicates that they’re not honest about this product. “Jake” doesn’t tell you how he drives traffic to his websites, what kind of websites he has or what he’s selling. He doesn’t even tell you what you are going to receive if you pay him $37. Truth be told, you are not getting a “system” that you just have to actívate to start making money. Systems like that don’t exist. You are getting some basic training and done-for-you sites that are not functional. These websites will not make you money overnight because you first need to drive traffic to them, which takes time and effort. Another thing I want to mention is that “Jake” is not even making money in a proper way because he’s ripping people off by using websites like Quick Home Websites. So, you cannot expect him to help you make money ethically because he’s not doing it. He (or whoever is behind Quick Home Websites) has been using one-page sites like quickhomewebsites.com to mislead people. For example, Your Dream Websites, Clone My Sites, Profit With Our Sites and Instant Profit Sites are other pages that I have exposed that are identical to quickhomewebsites.com. Because of this, I don’t believe that Quick Home Websites is a real program. I’m sure it’s a page that is being used to get you buy into another program. Does it only cost $37? According to Jake, this program only costs $37 and then you can already start making $1000 per day. Well, like I said, it’s not true that you can start making $1000 a day within a short period of time, but it’s not even true that you only need to spend $37 to start earning money. If you try to exit the page, you can purchase it for $27, but this is only the beginning. Just after making the payment, you will get bombarded with some upsells that cost hundreds of dollars, not to mention that if they will cost thousands of dollars if they come from a high-ticket program. Apart from that, you can also expect them to spam you with other scam sites or products about “making money online”. These con artists always do anything to get as much money as possible. Just the fact that they are not honest about how much it costs is enough for me not to trust them. Do you trust “Jake”? I personally don’t trust him because he’s not doing anything to prove that he’s not like the other scammers. He hides his face and doesn’t show anything that proves he’s a real person, which is a red flag because that’s what most scam artists do. Not only that, he doesn’t let us know how we can get in touch with him or how we can get our questions answered. Is he on social media? Or does he own a personal website? The fact that he’s hiding all this information is something that tells me “Jake” is not the real name of the owner of Quick Home Websites. I believe he’s a made up carácter and the real owner doesn’t reveal his identity because he doesn’t want to face the consequences of ripping people off. This is what most con artists do. Is Quick Home Websites a scam? The answer to this question really depends on your point of view. Some people will not call Quick Home Websites a scam because they provide something for your money. Others will call it a scam because it’s not a real system, it’s very misleading and it doesn’t live up to its promises. If you buy this product with the expectation that you can make $1000 per day quickly, you will feel ripped off. In my opinion, Quick Home Websites is not a total scam because it’s sold through ClickBetter, which means that you can get your money back if you buy it but end up not liking it. So they are basically telling you that what they claimed in the sales video was a total lie. Even though it’s possible to get a refund, I decided not to invest in it because I don’t believe it’s worth my time and time is a valuable resource that we can’t get back. The good news is that it’s completely possible to earn passive income every day with a website and many people (myself included) are doing it. I remember that when I was getting started, I wasted a lot of energy on get-rich-quick schemes until I realized that they only worked for the gurus to get richer. I’m grateful that I discovered a legitimate business model that has been working for decades and has given me a way to make a 4-digit monthly income online. I want to be completely honest with you, so I will not say that I didn’t have to work hard to make this happen. So, if someone like me (English is not my native language) can do this, I believe this is achievable for you too! Not only that, you will also find how you can get free access to training lessons that will help you get your business started the right way. In other terms, in my guide you will find all the details on how you can start today for free! You probably have lots of questions too, am I right? Don’t you worry, in my favorite online place you will find a community full of like-minded people who will be there to help you out. Also, you will also receive my personal guidance and support, so you can rest assured knowing that you are not alone in this new venture! Will you be next? I’m so excited to see you inside! I hope this Quick Home Websites review has been helpful to you and you will make the best possible decision. If there’s something else you want to know or you have any questions, please feel free to leave your comments below and I’ll get back to you ASAP! I’ve seen a lot of get rich quick schemes, but this is the first one I’ve seen where they admit that the average person who buys the program won’t make any money from it. Besides their own admittance, another sign that Quick Home Websites is a scam is that they tell you practically nothing about the program before you pay them the $37. Even though there’s supposedly a money back guarantee, I have a feeling that they would simply not answer any emails if anybody ever requested a refund. I so much love your honest review on “Quick Home Websites”. The fact that Jake hides his face and doesn’t show anything that proves he’s a real person, is truly a red flag. I have been scammed from such platforms before where the owner hides his face and one cannot get to know him personally. Thanks for sharing your free “how to Earn Money Online Guide” I actually clicked and read it and i was really blessed, am about to start taking actions on it soon. Cheers! Well, everyone need to be careful over everything they see online, not everything is worth trying all in the name of making quick money. I’m glad you took your time to put up this. In my own opinion, i will say it’s not totally a scam since people recover their money back when they end up not liking the product because it’s been sold through clickbetter. Yeah, I agree with you, thanks for sharing your thoughts! Nice article you’ve got there. I agree with the fact that if something sounds too good to be true, it is too good to be true, as well as that you’ve got to put some effort in making money, even if it’s passively. I also don’t really believe in MLM’s, which to me is basically just a pyramid scheme and it takes too much effort to let people join your team, just so you can get a little profit. The video of quick home websites isn’t also that professional, with 7 million dollars you can at least make something good. I did have a good laugh with it though. Thanks for commenting! I also had a good laugh with the Quick Home Websites video, especially when that guy says that people are making money while watching the video LOL it’s absurd. Awesome article. You were very thorough and highlighted several areas where potential customers should give some additional though. I particularly like how you exposed these areas but did not really bash the program. In the end you left if up to the reader to decide whether they want to be a part of it or not. That’s good and fair judgment to me. I also like how your content is split up with the different graphics and calls to action. Good job. I’m happy to hear that this post was helpful to you. Like you said, the final decision is up to the reader, I’m just here to inform. Thank you, Miren for spending your precious time in reviewing on Quick Home Websites. Your valuable work will save many of us from being the victim of such kinds of unreliable sources. In fact, I really don’t like the fake promises they made. I think making a review of scam or fraud sites is one of the most helpful posts to help many people on the internet. Its very kind of you for sharing this helpful informative post. Glad that you found this review helpful! I don’t like the fact that there are “people” trying to take advantage of others. Fast Cash App review – Is fastcash.click a scam? WOW! SEE THIS! IrMoney.win review – Scam alert!